Control which agents have Zendesk Talk permissions with a setting in their profiles. 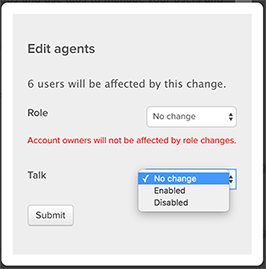 You can edit Talk permissions for individual agents or, if you use Zendesk Support's Enterprise plan, for multiple agents at once. 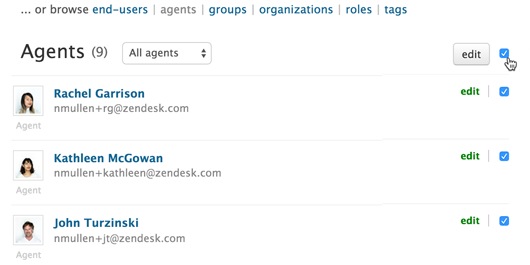 Note: If you are using Zendesk Talk Lite, all of your agents are Talk agents. You can't configure settings for individual agents. Enable the Talk Agent field. Check the boxes next to agents' names to select them for editing. You can also select all agents in the list by checking the box at the top of the list. In the window that appears, click the dropdown menu next to Talk. Select Enabled to apply talk permissions to selected agents or select Disabled to remove their Talk permissions. Hello, can I display a list of which agents are enabled for Talk? If so how? How are calls routed to my agents in Zendesk Talk?